Hoisin-marinaded stir fry – like a boss! Somehow going vegan has made me a better cook. 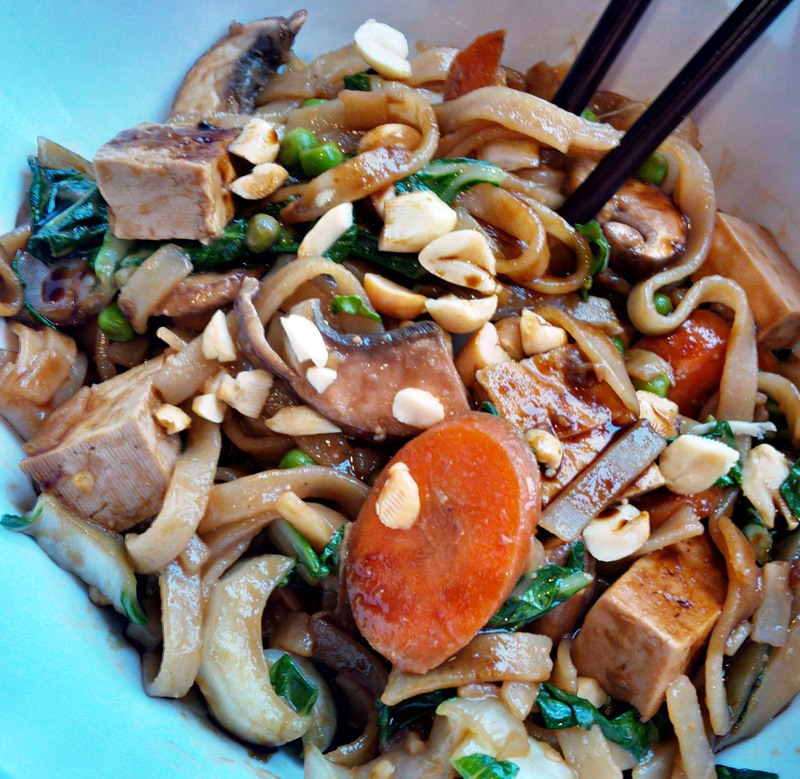 Pre-vegan days I tried making stir fries but they were uninspired and incredibly monotonous. Not any more. This might be my favourite stir fry ever. It’s easy yet has a flavor complexity, and is fun to eat with its many different textures and the slurpy noodles. Mix all the marinade ingredients in a bowl large enough to hold the cubed tofu. I find it helpful to first melt the nut butter in the microwave so it mixes more readily with the other marinade ingredients. Once your marinade is mixed, add the tofu cubes and toss them to coat them. Let them marinade for 10 minutes and up to 1 hour. While the tofu marinades, prep your veggies and cook the rice noodles according to the package directions. When the noodles are cooked, drain them and place them in a large serving bowl. Heat the oil in a wok or skillet on medium-high heat. Add the marinated tofu and marinade and sauté until the tofu starts to get some browned sides. When the tofu has some crispy colour, remove it from the wok and place it in the serving bowl with the rice noodles. Leave the marinade in the wok. Add the stir fry vegetables and cook them in the marinade mix. They will cook very quickly – in about 3 minutes. Remove them and the marinade and add them to the bowl along with the tofu and noodles. Toss everything and combine. Make sure the noodles are coated with marinade. Top with a sprinkle of chopped peanuts. This recipe makes 3-4 servings and is heavily based on a similar recipe from Vegan Richa.